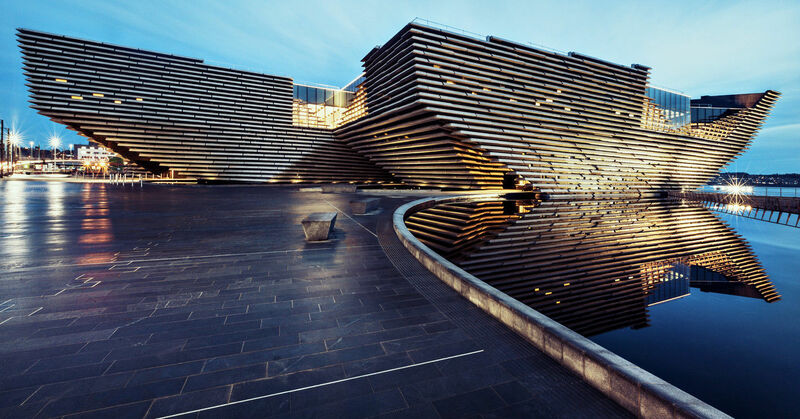 Located on the shore of the Tay River, the brand new V & A will become one of the most astounding buildings to open in 2018. 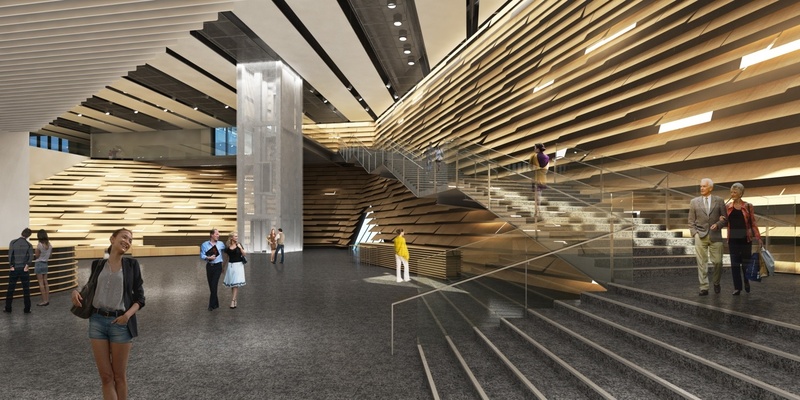 The design by Kengo Kuma was inspired by the Scottish cliffs and it's also a nod to the form of the RRS Discover, the last traditional wooden ship built in Britain, now turned into a tourist attraction. The building stands 18.4m high and has three floors. With no straight lines in the external walls, nearly 2K precast panels in order to look like a cliff. The shape of the building, who leans inwards and outwards, has been made with a hybrid structural skeleton, using reinforced concrete for the core, and internal and external walls, with structural steel for both first and second floors and the roof level. To get in, visitors have to cross a footbridge surrounded by water which runs through a tunnel. 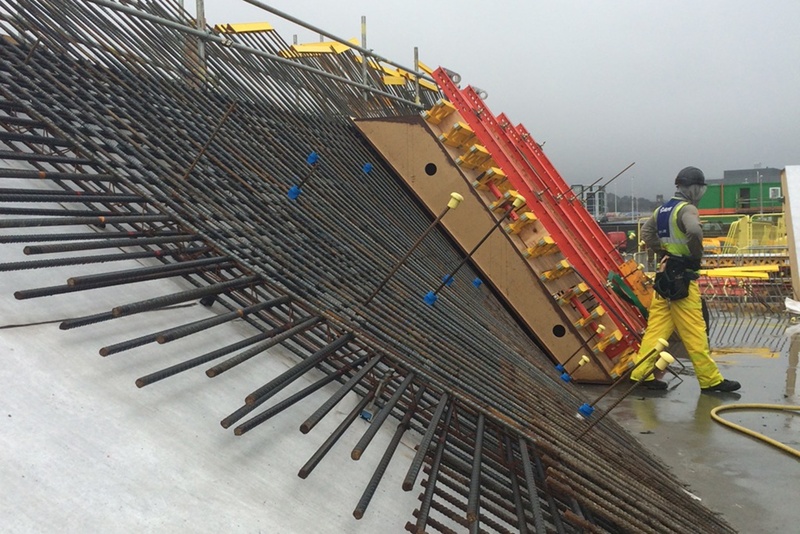 A 300mm thick slab on steel driven piles was used around the building perimeter to support the temporary works. “After a discussion with the architect, we decided to retain the base for the ponds which encapsulate the building – the design concept is for the museum to appear as if floating in the river,” states Boyd. “The rest of the pond bed we tanked later.” Due to the building design, the temporary works had to support the building during the construction process. “Some of the shutters were 2m to 3m deep due to curves, so we had to strengthen the timber to transfer the loads from the permanent structure,” explains Boyd. “At various points where the shutters couldn’t support the loads, we installed mega shores, 17 in total, around the building. The de-propping procedure was dictated by the loading paths. This process could only begin after the 682 tonnes of the structural steelwork was finished. “The loads don’t run vertically, but in circular patterns down through the building, so we had long discussions with structural engineer Arup about how to schedule the de-propping to avoid cracking,” says Boyd. “So we had to take a balanced approach. If removing props from the north elevation, we had to do the same on the south elevation, likewise with east and west. We worked from the top of the building down to ground level to progress the changing load paths from temporary to the permanent structure. Once the building was constructed, it was the time to start working in the external walls. The process began in September 2015, when the first shutter was placed. It took more than 2K cu m of concrete and 1K tonnes of reinforcement. Three weeks ahead of schedule, structural works were completed with the removal of the final shutter. Techrete was in charge of the design, manufacture and installation of the 2K precast panels for the V&A Dundee's facade. The process began in June 2015. “Every single precast plank was modeled by Techrete, which allowed us to go into the model, zoom in and spin the plank around to check it fitted the design,” says Boyd. “The higher level planks were fitted using mobile cranes, but the lower level sections, which are underslung, were installed with bespoke lifting equipment, which we designed with one of our specialist suppliers,” says Fotheringham.